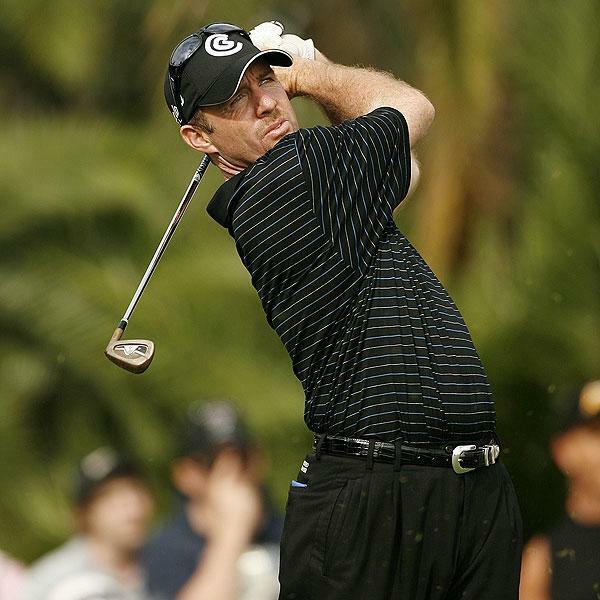 US PGA Tour player, Rod Pampling, defeated fellow Australian Marcus Fraser on the 3rd hole of sudden-death play-off to win the 30th Australian Masters. The play-off was held on the par four 18th hole, the toughest hole on the course, and twice Pampling and Fraser walked off with pars. Pampling finally put an end to the play-off by sinking a three-foot putt, after Fraser missed a six-foot putt for par. Fraser had his share of personal drama, with his heavily pregnant wife, Carlie, going to hospital in the morning because of concerns about early labor, returning to the course to watch him play in the afternoon, and then returning to hospital after feeling unwell. Robert Allenby’s quest went horribly wrong at the par three 15th hole where made double bogey. He had hit his tee shot into the front bunker, failed to get out with his second andÂ hit his third into another bunker. His fourth finished on the green but 15 metres from the pin. After the four terrible shots, he drained the long putt to avoid a triple but fell back to 9 under andÂ 3 shots from the lead. Allenby managed to make par on the final 3 holes to finish alone in 3rd place. It was an emotional day for Allenby with his ailing mother Sylvie, on the course in a cart to watch his bid for the title. Seriously ill with cancer, she took what may be her last opportunity to follow her son around the course in a tournament. US based South African, Tim Clark, would have rued his disastrous 4-over 3rd round. Day 4 was a completely different proposition for Clark who shot an impressive closing 67 that included six birdies in his first 11 holes to climb the leader board and finish at 8Â under in a tie for fourth place with Alexander Noren of Sweden (68) and US based Aussie Nathan Green (70). Unfortunately for Clark, the self-inflicted damage to his round on day 3 proved too much to make-up. Michael Sim, the joint overnight leader with Allenby, had a forgettable day, recording six bogeys and a lone birdie in a round of 77 that put him back to equal 11th place at 5 under par. The deciding of this years Masters by play-off seems to have continued a tradition with last years event decided by play-off also. The full leaderboard can be viewed at The Leaderboard.